Somewhere, the dam broke – and a trickling interest in the Lakota language has become a rushing torrent. 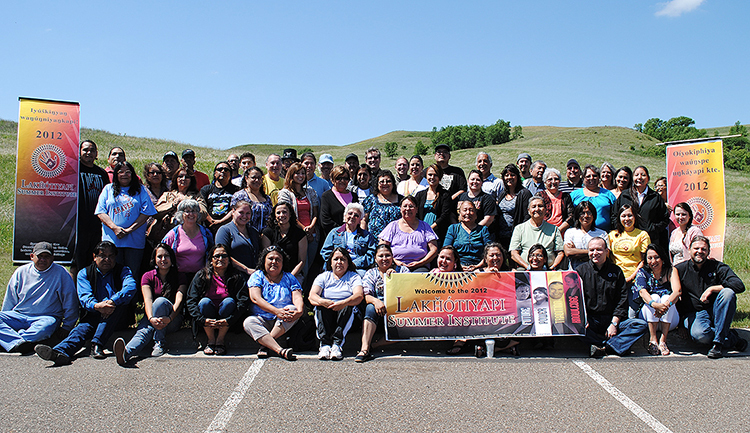 This year’s Lakota Summer Institute (June 4-22) completely exceeded all expectations, in attendance numbers, diversity of the participants, and a continuous excitement that changed lives and created new language activists. The Institute had 86 registered participants, the largest group ever, and many more visitors. Besides all of our teachers from the Dakotas, participants came from Texas, Virginia, New Mexico, Colorado, Minnesota and Chicago. LSI organizers and staff heard many such comments over the three weeks. The experience was intensely moving and even life-changing, as several younger participants were heard declaring that they now wanted to study linguistics and teach the language. We who put on LSI every year are very grateful for comments like these, which prove that the mad pressures and hard work going into LSI are all worth it. Another outcome that makes the work of LSI rewarding for us, and for everyone, is the friendship that happens. Veteran participants re-connect with peers and friends from past Institutes, and new friendships take hold in a vibrant spirit of camaraderie – bound together by the experience of learning and speaking a common language. LSI 2012 was extraordinary for other reasons, recounted elsewhere in this newsletter: a visit from 25 Maori language activists, and the production and performance of a short play in Lakota, Iktomi’s Raccoon Hat. A camera crew was also present during LSI’s last week, shooting footage for the documentary film now in production: Rising Voices/Hótȟaŋiŋpi. Can you see the stars in our eyes? An idea to use theater performance as a vivid way to learn Lakota in schools has been kicking around the LLC offices for nearly a year. With the approach of the Maori visit to LSI, we wanted to present a piece of the Lakota culture for them, in a new way. Quickly, our latest translation project became Iktomi Ohunkankan, a Lakota-language play made from traditional Trickster Tales, starring the mischief-maker Iktomi. The long-term objective is to dramatize several Iktomi stories into a play that can be performed by high schools – broken out into one tale at a time, or all put together in a longer piece. For the 2012 Lakota Summer Institute, we started with one Iktomi story, “Iktomi and the Raccoon Skin,” which was originally recorded by Ella Deloria, a Lakota linguist who lived and worked on Standing Rock from the 1930s until her death in 1971. LLC Communications Associate Shayne Laughter dramatized the tale into Iktomi’s Raccoon Hat, which got its initial translation into Lakota from LLC Linguistic Director Jan Ullrich. As 10 teachers at LSI read and rehearsed the play, Ben Black Bear rewrote, edited and refined the translation from his understanding as a first-language speaker of Lakota. What blew us all away was how the project ignited a wildfire of creativity from everyone involved. The participants made the props, set pieces and costumes themselves. They added an opening “grand entry” dance, a dance of river spirits, and a hilarious “mirror” gag. The cast (listed below) was led and inspired by the energy and commitment of Ben Black Bear, who played Iktomi. Music and sound effects were provided by Kevin Locke and Courtney Yellow Fat. Most of the cast came to the project with theatrical confidence earned by their experiences performing the voices of the Berenstain Bears characters for last year’s LLC production of the Matȟó Waúŋšila Thiwáhe cartoon series. A professional theater director, Rhiana Yazzie (Navajo) came in from her home in Minneapolis to get the show on its feet at the Standing Rock High School Auditorium on June 21. The performance was followed by a haka dance by the visiting Maori language activists (see related story), and about 300 people packed the hall. 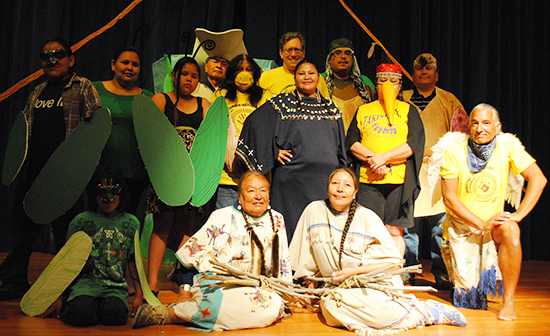 Since most in the audience were not Lakota speakers, LLC projected the dialogue in English “supertitles” to help out – but with the amount of physical humor the performers added, not much help was needed! Several of the participating teachers quickly began discussing how to put on performances of Iktomi’s Raccoon Hat at tribal schools, and at the Lakota-Nakota-Dakota Language Summit in November. Keep checking the Iktomi’s Raccoon Hat Facebook page for further information. LLC is grateful to two funding sources for their support of Iktomi’s Raccoon Hat. South Dakota Arts Council support is provided with funds from the State of South Dakota, through the Department of Tourism and State Development, and the National Endowment for the Arts. The Puffin Foundation West, Ltd. also provided substantial support, and we send them our profound thanks. Iktomi – Ben Black Bear is a Lakota language director at St. Francis Mission. Iktomi’s Wife – Naomi Last Horse is a Lakota language teacher at Porcupine School. Grasshopper – Waniya Locke is a LLEAP student at the University of South Dakota. Grasshopper’s Children are children of Waniya Locke and Naomi Last Horse. Little Bird – Helene Circle Eagle is a Lakota language teacher in Eagle Butte School. Little Bird – Suella High Elk is a Lakota language teacher at Eagle Butte School. Hawk – Ken Little Thunder is a Lakota language teacher at Cheyenne River. Woodpecker – Iris Eagle Chasing is a Lakota language teacher at Takini School. Meadowlark – Kevin Locke is an internationally acclaimed Lakota Hoop dancer and flutist. Turtle – Courtney Yellow Fat is a Lakota language teacher at Standing Rock Middle School. Dawn – Bernadine Little Thunder is a Lakota language speaker from Cheyenne River. Sunset – Sandra Black Bear works for the Rosebud Sioux Tribe. Thunder and bucketing rain broke over Sitting Bull College just as 25 Maori Native language activists from New Zealand pulled up in their tour bus on Wednesday, June 20. Both Lakota and Maori held this as a blessing and an auspicious beginning to the Maori visit to the Lakota Summer Institute – even though it delayed the welcoming ceremony a bit. After about 10 minutes of a pounding downpour, the shower stopped and the clouds parted, the air smelled wonderful and the prairie showed a deeper green. Three large tipis were set up in an outdoor space the size of a football field behind the College. Stepping out of their bus onto a new land, the Maori began a traditional haka dance and song, showing their fierceness as warriors as they entered unfamiliar ground. The haka dance is a group dance with vigorous movements - foot-stamping and exaggerated facial expressions. The vocals are rhythmic shouts in unison, usually led by a woman soloist. When they reached the midpoint of the field, they stopped. The Lakota approached the Maori and shook hands, then the entire group formed an enormous circle and a drumbeat began – the circle became a simple dance and song for the whole group. Then, of course, it was time to eat! A barbecue lunch was occasion for Dr. Laurel Vermillion, the President of Sitting Bull College, to give a welcoming address. The Maori visit to LSI was long-planned, based on mutual interest of Maori language activists in New Zealand and the growing number of Lakotas who are passionate about learning their language. Maori are an indigenous people in the Australasian islands of the Pacific Ocean, and are now mostly located in New Zealand. They have endured the same assimilation and cultural suppression as other tribes around the world, but have reclaimed their language and culture to such an extent that Maori is one of New Zealand’s three official languages, and there is even a Maori-language television channel in New Zealand. 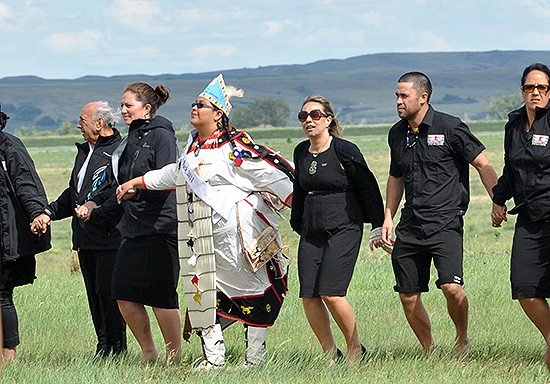 Maori language activists involved with the Te Panekiretanga o Te Reo (a New Zealand educational organization) decided to travel to Lakota Country to exchange ideas and experiences about language revitalization. Their hope was to present the world of possibilities open to Lakota learners if they just continue on the path and don’t give up on the goal of fluency. The Maori visitors were aged from 17 to 70 and came from a variety of professional backgrounds. There were doctors, media professionals and newscasters, university students and retirees. All shared that they had achieved fluency while learning Maori as a second language. Timoti Karetu was adopted into the Lakota tribe & given a Lakota naming ceremony. The Maori were presented with gifts of sage, sweetgrass, star quilts, hats, tee shirts, Matȟó Waúŋšila Thiwáhe DVDs, and gift bags. The Lakota displayed magnificent generosity in their gifts, but the Maori definitely out-danced us all! The group performed three fully choreographed hakas – for their arrival, for Karetu’s naming ceremony, and on the evening of the Lakota-language play. Kevin Locke, a LSI instructor and world-traveled Lakota performer, gave a Hoop dance at the end to see them off – which was a joyful end to an extremely positive experience. The only regret for both hosts and guests was that the visit lasted only a day and a half! Both sides wished for more casual socializing and getting to know each other. That is definitely something to plan for in the future! Also more photos are available at the LLC facebook page . An activity from the new Level 4 Textbook. Level 4 Lakȟótiya Wóglaka Po! Speak Lakota! Textbook is now shipping to LLC-affiliated schools and is available to the public. LLC always tries to challenge itself to produce a better, more effective textbook with every level of instruction – in a way, we start over each time and push ourselves to new excellence. Level 4 has definitely raised the bar, with 10 units designed to help children create the most useful kinds of sentences for their age. Topics focus on activities relevant to children and youth in Lakota Country, such as horse care, vision quest, free time, and sharing. Grammar lessons allow students to talk about what they like, things they do, and travel, using first, second and third-person sentence constructions. All of the lessons and activities are conceived to make the act of learning as intuitive and accessible as possible. Level 4 brings a new visual style to the Lakȟótiya Wóglaka Po! Speak Lakota! series. Laura Nikiel , the award-winning illustrator of Sing-Along Christmas Songs and In Jesse’s Shoes, brings an optimism and vibrant excitement to Bob, Lisa and the gang, while staying true to the culture and the “world of the child” – that is, how children see and interact with their environment and others around them. This sensitivity is sure to connect with the “world of the child” in every language learner, no matter how old! All in all, this book is a great accomplishment for our development team: Linguistic Director Jan Ullrich and second-language education expert Kimberlee Campbell, and layout developer and Liz Woock. Congratulations, and kind thanks for your hard work! Students finishing the Level 4 textbook are sure to be moved well forward on their journey towards fluency. Rising Voices/ Hótȟaŋiŋpi, the documentary film now being produced under the wing of LLC’s sister non-profit, The Language Conservancy , finished its “development” phase during the final week of LSI. 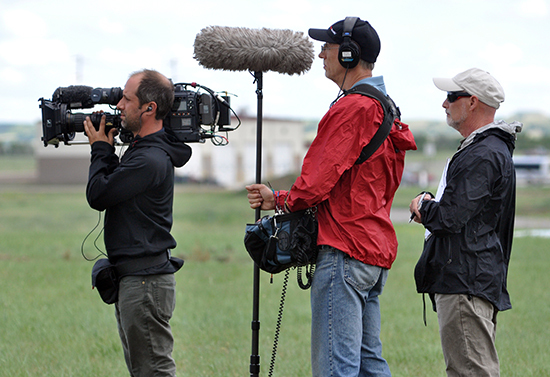 Producer-Director Larry Hott began that phase at last summer’s LSI, collecting audio interviews and preliminary footage of landscapes and life in Lakota Country. This year, Hott returned with a small crew and shot footage of the land, another 10 interviews with Lakota language learners and activists, and followed the visit of the Maori to Wounded Knee and Sitting Bull College. This footage will become a “baseline” for the project’s future growth, as it will be edited into a short trailer and will help clarify the storylines Hott will follow through the next year or two of production. Hott hopes to shoot through all three weeks of the Lakota Summer Institute in 2013. Hott told us he is “overall very pleased” with the early phase of Rising Voices/ Hótȟaŋiŋpi, and he said this project has moved from inception through development into production faster than any other project he has seen. LLC feels that Rising Voices/ Hótȟaŋiŋpi is, in a way, ahead of the curve – articles about the crisis of disappearing languages have started to appear in the New York Times and National Geographic, and smaller, shorter documentary films are emerging. Rising Voices/ Hótȟaŋiŋpi is intended to document language endangerment and revival in a positive and meaningful way, encouraging the languages’ use in the modern world and modern arts, and we hope it will encourage other indigenous groups to pursue similar goals. Funding for development was provided by Dakota Indian Foundation, Native American Public Telecommunications and funding for intial productions provided by the Administration for Native Americans. Last summer, LSI participants met Larry Hott, director–producer with Florentine Films/Hott Productions. Hott was conducting preliminary interviews for the documentary film Rising Voices/ Hótȟaŋiŋpii, which is a co-production of Florentine/Hott and LLC’s sister organization, The Language Conservancy. This summer, Hott and a small production crew will begin full production of Rising Voices/ Hótȟaŋiŋpi by attending LSI and documenting classes, interviewing participants, and filming the interaction of LSI students and 30 visiting Maori New Zealanders. Rising Voices/ Hótȟaŋiŋpi is comprised of several complementary media productions, all created with two goals: to inspire young Lakotas to commit to learning the language, and to establish a national conversation on Native American language loss and recovery -- what that means to communities, individuals and the American heritage. 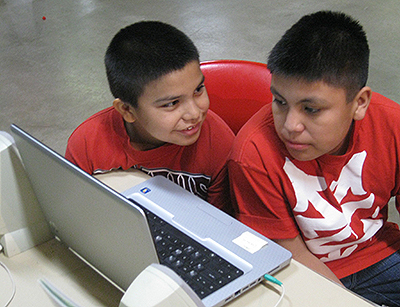 The project is anchored by a 90-minute documentary film on the Lakota language revitalization movement, intended for public television broadcast, and expanded to encompass all tribes and their languages through an extensive online interactive campaign. Early support for Rising Voices/ Hótȟaŋiŋpi has come from the Dakota Indian Foundation and Native American Public Telecommunications (NAPT). NAPT is very enthusiastic about the project, and will be a close partner as we proceed. Supporters have emerged among scholars and Native organizations, as we apply for major funding; for our application to the National Endowment for the Humanities, 20 scholars and Native language activists sent letters of support. We anticipate further support from the Administration for Native Americans (ANA, US Department of Health & Human Services) as filming will document teachers’ introduction to the Level 5 textbook and use of earlier textbooks, all of which have been partially funded by ANA. The 90-minute Rising Voices/ Hótȟaŋiŋpi television documentary will have an unusual feature: five short creative films about the Lakota language, made by Lakota filmmakers and artists, placed between the film’s thematic sections. Larry Hott used this technique in his previous PBS film, Through Deaf Eyes, to allow Deaf artists to communicate in their own way the experience of being Deaf in America. We are still looking for Lakota filmmakers and artists to produce these five-to-eight minute films. We are also planning to help regional PBS stations coordinate production of 30-minute ancillary films about the Native languages in their locality, so please contact Florentine Films/Hott Productions at hott@florentinefilms.org if you are interested in this aspect of the project. Travis came to the Lakota Summer Institute in 2011 and speaks Lakota to his three young children, ages 1, 3, and 4, and his youngest son’s first spoken word was Lakota. The obstacle he faces now is the time he must devote to his career, which limits his time with his children. Still, he does speak Lakota to his clients at the health center. He says his ultimate goal is to be a fluent speaker and teach in an immersion school, even though at this stage he feels that he is just “100 yards into a marathon.” We welcome Travis’ energy and commitment to the language! At the same time, we bid farewell to founding Board member Dr. David Rood. He helped steer the organization onto a stable, confident path, and provided tremendous support for the linguistic and documentation aspects of LLC’s work. We want to thank Dr. Rood for his excellent service and commitment to the Lakota language. 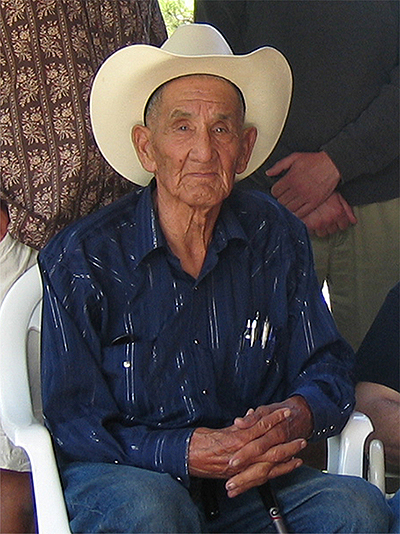 We are very saddened by the passing of Johnson Holy Rock, who died on Saturday, January 21, 2012 at the age of 93. Mr. Holy Rock was one of the founders of the Lakota Language Consortium and served from 2004-2008 on the LLC board of directors. His leadership regarding the Lakota language was very influential as he was one of the most fluent Lakota speakers surviving into the 21st century. 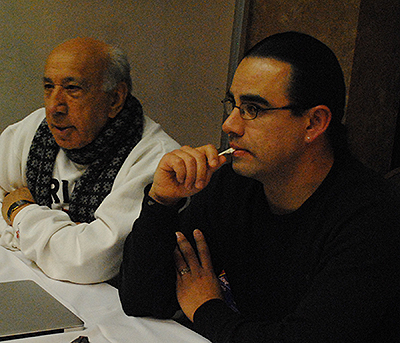 His decisions and recommendations significantly shaped the Lakota Language Consortium's policies, products and services. In his life story -- which he recorded in Lakota -- he told how he was born in 1918 to older parents. His mother "was in her 60s and I was a surprise to everybody," he told Native Sun News in an earlier interview. "When my mother would tell people I was her son, they thought she was telling a tall tale." He said that his father had been born in a tipi while the Lakota were still roaming freely along the Powder River in the 1870s. He did not start going to school until he was 8, by which time he spoke fluent Lakota, his first language, as well as English, which his older sisters taught to him. His language skills and eloquence in both Lakota and English was exemplary and he was a man of rare intelligence and sophistication. He was a WWII veteran and served as the President of the Oglala Sioux Tribe between 1966 and 1968, and was co-Chairman of the Gray Eagle Society, an organization of Lakota elders. During his term as tribal president he met with U. S. President John F. Kennedy in the White House in an attempt to improve the housing situation on the Pine Ridge Reservation. His efforts helped bring the first modern housing development to Pine Ridge. He also worked in support of Treaty rights and helped Lakota WWII veterans get health care and a hospital. Johnson Holy Rock was a very kind man and one who represented the best values of Lakota culture. As he was the only son and had no sons himself, the name Holy Rock is leaving this world with him. In a way, an era has ended with his passing, as he was probably the last link to the pre-reservation times, raised by his grandparents, who were alive at the time of the Battle of Little Bighorn. Lakota language teachers at LLC-affiliated schools in Standing Rock are now actively using the Matȟó Waúŋšila Thiwáhe DVD in classroom instruction. 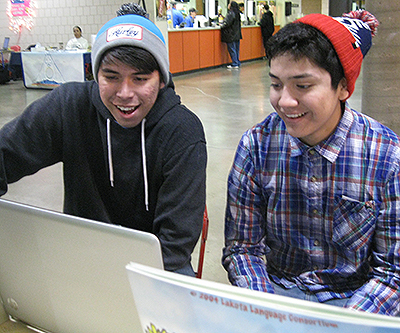 Reports from the field indicate that the impact of a Lakota-language cartoon is just as powerful as we had hoped. Delores Taken Alive's kindergarteners at McLaughlin Elementary School in McLaughlin, SD not only pay extremely close attention for the full duration of the episodes, they also repeat simple phrases out loud and in unison. Language-acquisition research indicates that such complete attention and repetition are the way in which young children engage their innate language-learning abilities. LLC expects that these children will have very different expectations of learning and speaking Lakota, because of this early exposure and participation. We have great hopes that this will encourage children and youth to want more from their teachers and their school instruction. 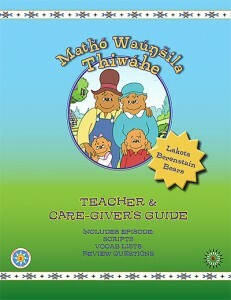 Jan Berenstain, co-creator of the Berenstain Bears characters and childrens' books, expressed her liking for the Lakota version when it premiered on regional PBS stations in September, 2011. Sadly, Mrs. Berenstain passed away on February 25, at age 88. LLC offers its condolences to her family and friends. We are honored that Matȟó Waúŋšila Thiwáhe is part of the legacy created by her generosity and gentleness. Those of you who post videos on YouTube are probably familiar with the analytical information YouTube tosses up every month – how many viewers, what type of technology they used to view your piece, etc. That report tells LLC that the Matȟó Waúŋšila Thiwáhe videos have now been viewed more than 60,000 times. Some additionally interesting statistics indicate that the majority of US viewers are women between the ages of 45 and 65. "This will be very valuable to my daughter who is 1 years old! I am not fluent unfortunately and we can learn together :)"
"I am so proud of the people...this is wonderful and I feel near tears! I truely hope the children will learn the language from this." "This is amazing, keep up the good work"
"This is so awesome! brought me to tears when I first saw this. It is wonderful to see tribal languages being used with this cartoon! I remember watching this when I was younger. It is great to know that children are going to remember this show in a different language than English. GREAT WORK!" "I think it's really beautiful that you are saving this language. I remember reading this very episode to my daughter, in English, when she was little." " woooooow!!! just...ATA KHILI!!! that is great for me! i can learn more! iam learning lakota! but the writting is hard for me...! :) i wish i could help for the project! keep doing it!!" "omgsh this will be good for my lil one to watch :) how awesome thanks for this :)"
Both the Matȟó Waúŋšila Thiwáhe DVD and the 220-page Teachers’ and Caregivers’ Guide can be ordered at the LLC bookstore. They are also available from select retailers such as Prairie Edge Bookstore in Rapid City, SD. Standing Rock Sioux Tribe, as co-producers of the entire project, will also distribute DVDs.